I first noticed Oslo’s City Hall (Rådhuset) from the grounds of Akershus Fortress, just around the bend of the harbor in Oslofjord. The reddish-brown–brick building and its two towers seemed rather unremarkable to me — an offputting, brooding, hulkish edifice. But, oh, how first impressions can sometimes be very wrong, and the closer I got to it, the more interesting and captivating City Hall became. Sculptural groups enhance a sometimes stark exterior. Designed in 1918 but delayed because of lack of funds, construction on City Hall didn’t begin until 1931. Delayed again for years thanks to World War II, it was finally completed in 1950, just in time for the city’s 900th birthday. Already aesthetically outdated by the time it was finished (although popular in 1918, brick had fallen out of fashion by 1950), the blocky building today still holds a commanding position across the wide street fronting the myriad types of boats harbored in Oslofjord. I approached it from the harbor-facing rear side, not too impressed by the functionalist style. 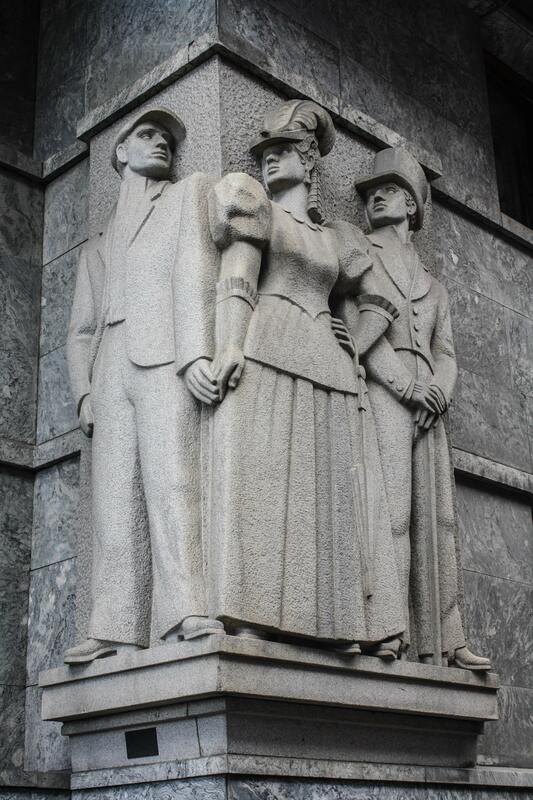 Things started to improve for me when I looked up at the stone sculptural arrangement on the façade depicting the patron saint of Oslo, St. Hallvard, who was killed while attempting to save a woman from robbers and thrown into the fjord with a millstone around his neck — when he floated to the surface, he was hailed a martyr. Working my way around the side, I noticed another intriguing stone sculptural grouping at one of the building’s corners. This scene from the author and painter Christian Krohg’s Albertine, an 1886 novel about prostitution that caused quite the scandal and was confiscated by the police, shows a well-dressed man and woman standing side by side, but the woman is secretly holding the hand of her cicisbeo on the other corner. I was starting to like this city hall now, even more so when I noticed the fluctuations in the brick façade, with a few rows of vertical bricks amid all the horizontal bands, a chevron design at the top, and several instances of a herringbone pattern. The Main Hall is a dazzling display of color. I strolled into the courtyard fronting the main entrance and looked up at the two towers, one about 206 feet tall, the other about 10 feet taller. From the ground, I could spy some of the 49 bells in the east tower. At the bottom of each, an arcade houses 16 decorative, colorfully painted pine-deck timber reliefs depicting scenes from Norse mythology, including superstars Odin and Tor, that completely won me over. Between the two towers, a lower central part of City Hall features an astrological clock on the right side and a bronze relief depicting Norwegians engaged in ordinary activities like fishing, farming, and dancing above the main doors, separated by a trumeau that bears three panels of wood sculpture, including a Viking slaying a particularly fearsome serpent. Medallions on the columns on either side of the entrance feature such objects as a Viking ship and a bird in flight. The Feast Gallery boasts a remarkable ceiling. I walked inside and entered the massive Main Hall, one of Norway’s largest public indoor spaces (16,350 square feet). Abundant light pours in from clerestory windows above, like a cathedral or ancient royal hall, bringing to light all the wonderful colors of the beamed ceiling and the numerous murals — including Henrik Sørensen’s Work, Administration and Celebration, the largest oil painting in the country — that depict everything from Oslo and Norway between the two world wars and during Nazi occupation, to Norse mythology, to everyday life and the growth of the city’s commercial activity. In a corner above the base of the marble staircase, a set of fake organ pipes gives a nod to Norway’s musical heritage while simultaneously hinting that you have just entered a hallowed “church of state.” I climbed the stairs up to the Munch Room and the Banquet Hall, with its royal portraits and fresco of beach life. 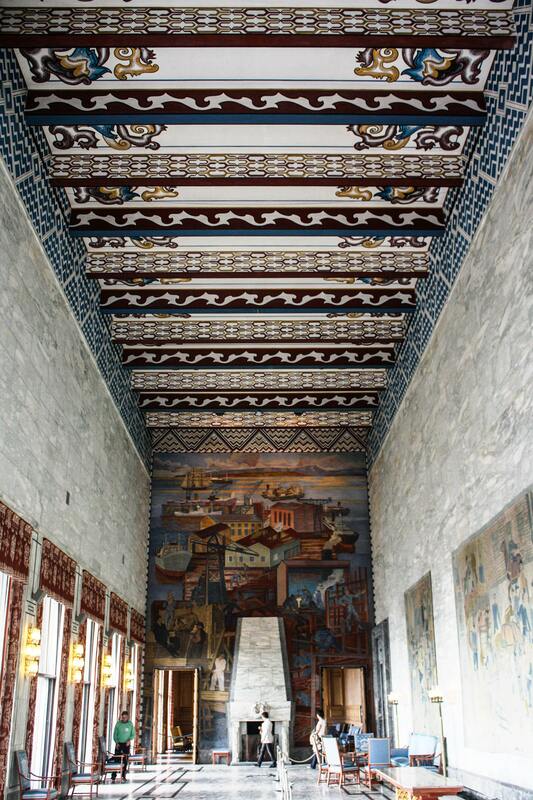 The Feast Gallery boasts a gorgeous beamed ceiling, tapestries, red curtains woven with images of Norwegian ships and buildings, along with the word “Oslo” and the Norwegian coat of arms, and a floor-to-ceiling fresco depicting Norwegian agriculture, factories, fishing, and shipbuilding. The semi-circular oak-clad City Council Room features a tapestry of St. Hallvard and the seven virtues — a deliberate attempt on the part of the artist to remind Oslo’s politicians of morals and ethical decision-making. 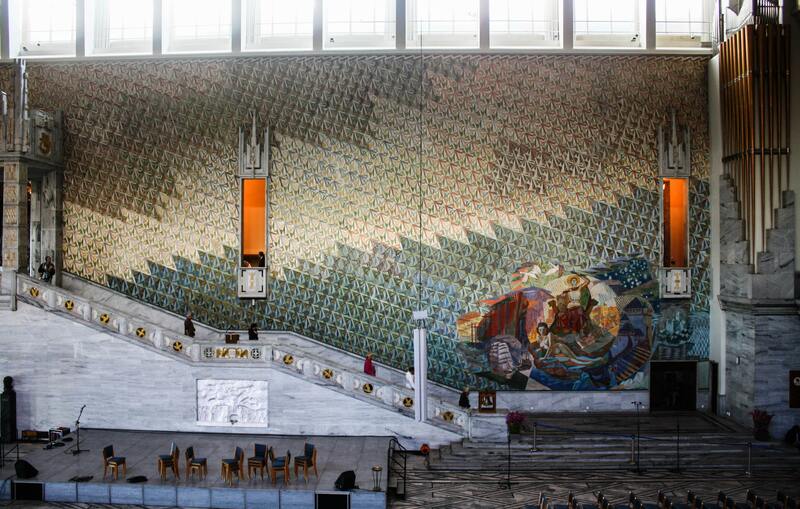 All told, eight painters and 17 sculptors were hired to embellish Oslo’s City Hall. It’s a visual feast for visitors, and for those attending the annual Nobel Peace Prize ceremony, held here every December 10. It was also a reminder that books should not be judged by their cover, otherwise I would have very possibly passed by this exceptional attraction.